Admit it; you like to play games on your computer just as much as the next guy. 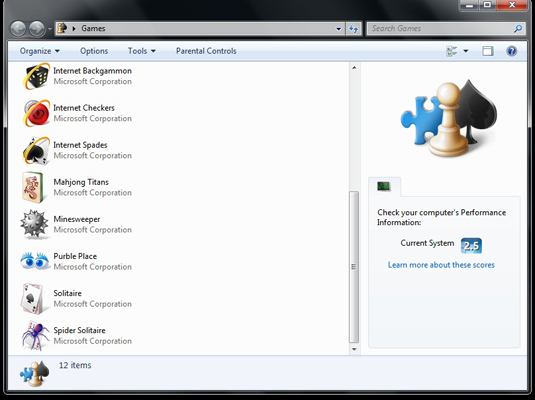 One of the easiest ways to access your favorite Windows games is to use the Games Explorer in Windows 7. The Windows 7 Games Explorer is easier to use and more intuitive than its predecessors. Most of the games included with Windows 7 are based on traditional card games and board games. In Windows 7, Microsoft has introduced three new games (Backgammon, Checkers, and Spades) that you can play online against live opponents from around the globe. Unfortunately, Microsoft dropped one of the games that it added to Windows Vista; namely InkBall. You choose Start→Games to open the Games Explorer. The first time you do this, the Set Up Games dialog box appears. Click the option labeled Yes, Use Recommended Settings to get to the Games Explorer. In the Preview pane on the right of the Games Explorer, you may see a note indicating that this computer’s performance information has not been created. That’s okay — the performance information isn’t crucial at this time. When you start a game, you may receive a warning about slow game performance. Don’t be alarmed. Click OK to start the game. In the Games Explorer, click a game to find out more about it. 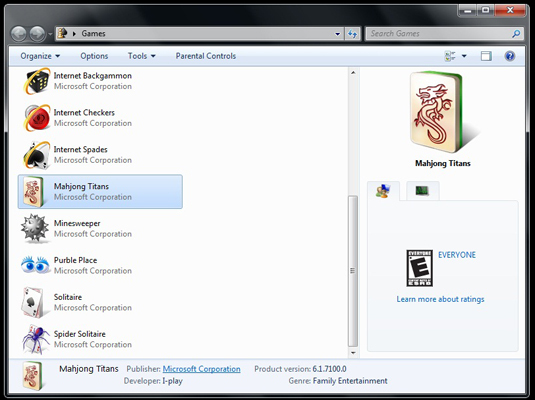 The Details pane at the bottom of the Games Explorer displays information about the selected game. The Preview pane to the right displays tabs for the game, including rating, performance requirements, and statistics, if any. As with Windows Explorer, you can hide or display the Preview pane by clicking on the button near the far-right side of the Command bar.